The Watch toggle button in the Debug toolbox opens or closes the Watch window. Individual variables and expressions can be watched for different conditions. 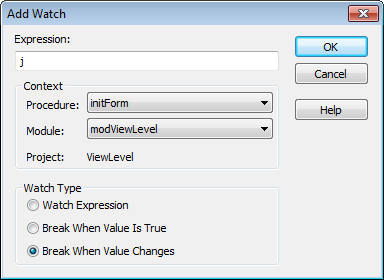 To add a variable or expression to the watch list highlight the value in the code window. Right click on the mouse and select Add Watch from the pop-up menu. The Add Watch dialog is displayed allowing for configuring the watch settings. The expression is added to the watch window and is updated in real time as your program executes in debug mode.